How does a gas exert pressure on the walls of its container? Air molecules are in constant random motion. They collide the walls of the container and exert a force on it. Since pressure is force per unit area, pressure is created on the walls. At a higher temperature, the gas molecules have higher kinetic energy and move faster. The gas molecules will then collide the walls of the container more frequently and forcefully. This causes an increase in gas pressure inside the container since pressure is force per unit area. The gas molecules will then collide the walls of the container more frequently and forcefully, causing the pressure in the system to rise initially. To maintain a constant pressure, the air expands and the air molecules move further apart, hence causing the volume to increase. When the volume of the gas is decreased, the number of gas molecules per unit volume increases. 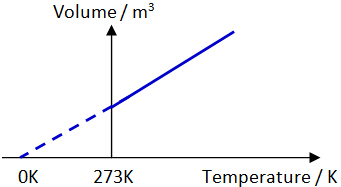 In general, pressure, volume and temperature of a fixed mass of gas can be related by this equation. Note that this equation is not in O-level syllabus, but you can use it to analyze the relationships between pressure, volume and temperature. To help you understand these concepts better, you can play with the applet below. Reset the simulation and pump some air molecules into the container. 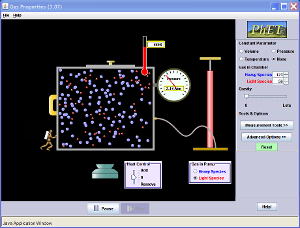 When the value on the pressure gauge is constant, select "temperature" under constant parameter to keep temperature constant in this simulation. Decreases the volume of container by move the door to the right. You should be able to see that the value from the pressure gauge increases. This means pressure in the container increases. Thus, we can conclude that when volume decreases, pressure increases. Pump some air molecules into the container. Caution: Do not pump too many air molecules into the container. You can see that once the air molecules are inside the container, there is a pressure which indicated by the value from the pressure gauge. Continue from above steps in (a). When the value on the pressure gauge is constant, select "volume" under constant parameter to keep volume constant in this simulation. Supply heat to the container by move the slider on heat control to "add" such that temperature in the container is increased. While increasing the temperature, you should also see that the value from the pressure gauge also increases. This means pressure in the container increases. Thus, we can conclude that when temperature increases, pressure also increases. When the value on the pressure gauge is constant, select "pressure" under constant parameter to keep pressure constant in this simulation. While increasing the temperature, you should see that the volume of the container also increases. Thus, we can conclude that when temperature increases, pressure also increases. The Figure shows a stationary frictionless gas-tight piston P in a cylinder C which contains gas. The pressure of the gas inside is 1.0 x 10^(5) Pa.
(a) Use the kinetic molecular model of matter to explain why the pressure on P is equal to that on the end E of the cylinder. ﻿(b) While keeping the temperature constant, the piston is now moved to the left such that volume of the gas is reduced by one-tenth. Calculate the final pressure of the gas. (c) What happen when the gas is heated. (a) The gas molecules hit the piston as well as all the walls of the container equally. Equal number of molecules will hit the surface of the piston as well as end of the container, E. The frequency of collision is the same thus, pressure is the same.